Step 1: Click on Sale option in the Payments menu. The merchant will be brought to a page where payment data is entered. 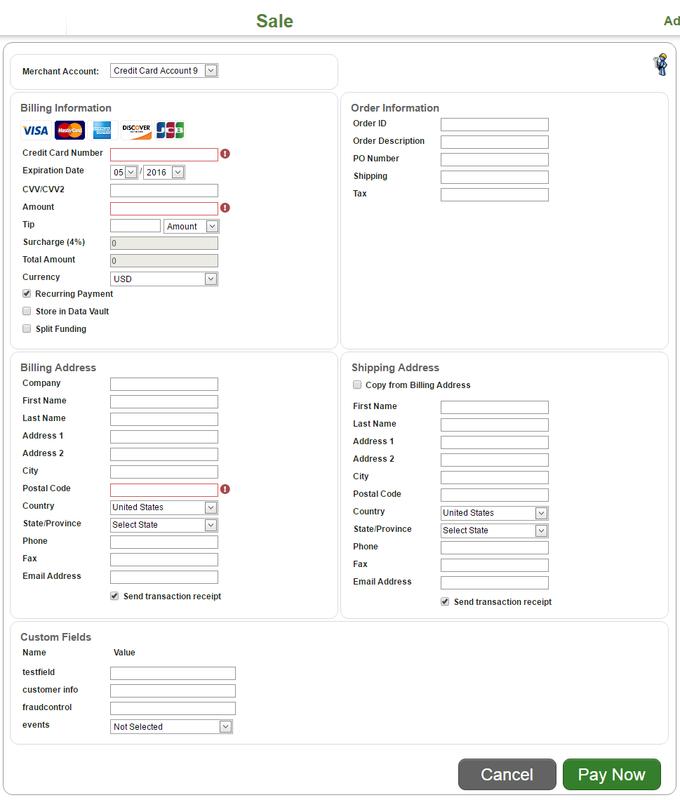 Step 2: Select the Merchant Account from the Account list box. The names in this list are the same arbitrary names chosen when setting up your merchant accounts. Below are some examples of merchant account names that might be chosen. Step 3: Enter Billing Information. Currency for merchants using multi-currency processing the Currency field will appear. Choose the currency for the current transaction. 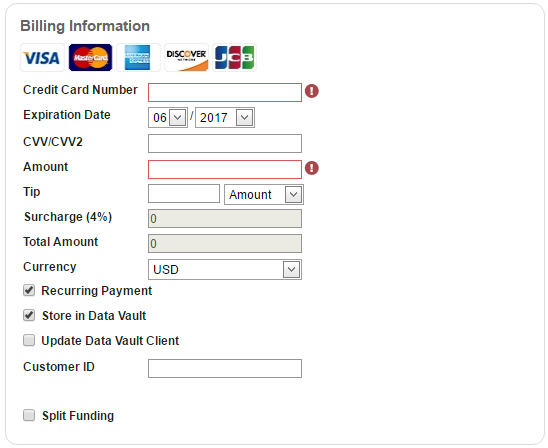 Store in Data Vault (checkbox option) - If the customer is identified as new, then a new Data Vault client will be created with payment/contact info from the transaction data and a DV token will be generated. The payment transaction will be assigned to this new DV client. If the Data Vault found client according to the customer identification rules, then the payment transaction will be assigned to this Data Vault client (Customer Identification is described in Customers section of this user guide). This option does not update the Data Vault client information. Update Data Vault Client (checkbox option) - If the customer is not found according to the customer identification rules, Data Vault will behave the same as when the Store in Data Vault option is selected. If the Data Vault finds a client, then the payment transaction will be assigned to this Data Vault client and client payment/contact info will be updated according to the transaction's data. Customer ID - external customer identifier which will be assigned to the customer. Split Funding (check box option). 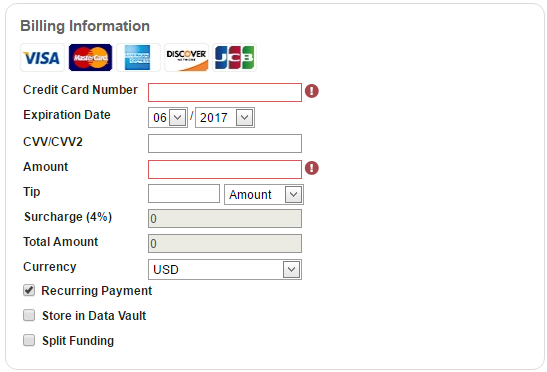 Select this option if the transaction amount must be split between several Data Vault customers. After selecting this option the list of all created split groups appears and you can select one of them. When group is selected you can view its details by clicking the 'Details' link. Management of split funding is described in Data Vault section of this user guide. Tip: The currency for a merchant account is determined during setup of a merchant account and is referred to as the Home Currency. Transactions will settle in the Home Currency regardless of the transaction currency type. Step 4: Complete the Billing Address. When activated, FBI Tools’ fraud filters will use this address as a parameter when evaluating Sales. Step 5: Enter Order Information (Optional). Step 6: Enter the Shipping Address. The Shipping Address is where the products or services will be delivered. When activated, FBI Tools’ fraud filters will use this address as a parameter when evaluating Sales. Custom Fields are data fields created by the merchant to accept, track and pass on data that he/she wants to be part of a transaction life cycle. For more information on creating and using custom fields, see the Custom Fields Setup section of this document. Tip: To be visible in the Virtual Terminal, Custom Fields must be designated as such in the Custom Fields Setup page. Secondly, the Virtual Terminal configuration must have Custom Fields activated. Step 7: Enter Custom Fields. All Custom Fields marked to display in the Virtual Terminal will display at the bottom of the page. After you complete all sections, the transaction may be processed by clicking the Sale button. Once complete, the system will process the transaction and transition you to a receipt page. Receipts can be emailed to any address by clicking the Email Receipt button. Note, prior to settlement (or the end of the day), this transaction can be cancelled by using the Void function. The status of the transaction will be marked as Cancelled in reports and on the updated receipt. If a new business day has begun, you must perform a Refund if you want to cancel the transaction. The status would change to Refunded.